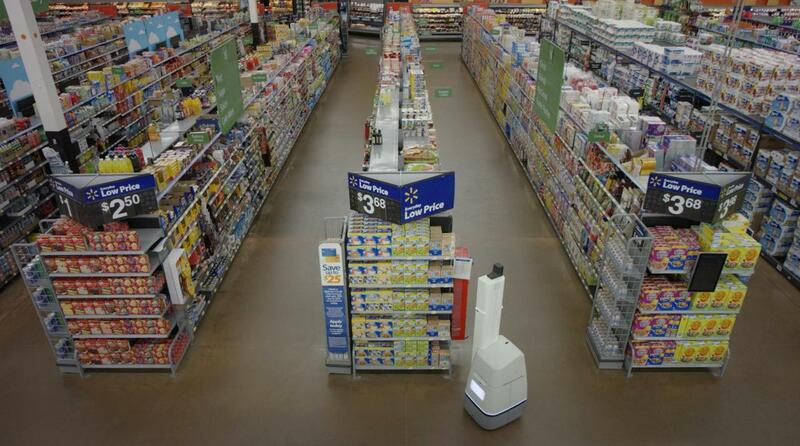 Inside 50 of Walmart’s U.S. stores, robots resembling vacuum cleaners affixed with small, sleek towers, patrol the aisles, checking whether the shelves are stocked with enough toilet paper and that laundry detergent has the correct price tag. Walmart is testing the robots, built by Bossa Nova Robotics, to see if they can monitor store inventory more cheaply than human workers. The test reflects the increasing adoption of technology by big retailers as they try to keep up with online retail giant Amazon, which uses robots in some of its warehouses in addition to other cutting-edge technology. Target and Lowe’s are already testing robots in physical stores for handling mundane jobs like scanning shelves. Target, for example is using the robotic services of the startup Simbe Robotics to scan aisles. Every day, one of Walmart’s robots rolls down every aisle three times to check that over 150,000 products are where they should be on store shelves, Martin Hitch, chief business officer for Bossa Nova Robotics, said Monday at the MIT Technology Review’sEmTech Digital conference in San Francisco. The robot will keep a record whether there isn’t enough toilet paper, or if an item doesn’t have the right price tag. From there, a human store clerk will either re-stock the aisle or put the right price tag on the product, because the robots are not physically capable of doing so. Among the findings from Walmart’s test is that people’s perceptions change the longer they see the robots in action. For example, two years ago when Bossa Nova first installed a robot at a Walmart store in rural Pennsylvania, local residents were very curious about the machines and spent time gawking at them, Hitch said, but they now completely ignore them. “It’s allowed to do its job,” Hitch said. When asked how different types of people react to the robots, Hitch said that children, particularly school children, tend to be “very respectful of the robot.” Adults, on the other hand, sometimes either goof around with the robots by asking how they are doing or other silly questions, or ignore them. Teenagers, however, pose a challenge for Bossa Nova’s Walmart robots because of their “mischievous” nature, Hitch said. Hitch said that Bossa Nova has gotten used to teenagers playing pranks on robots, and that the company has taken that into account in its robot designs. Presumably, these robots must be built in a way that they can withstand having cans of tomato soup thrown at them by high schoolers. Another thing Bossa Nova did was to design the robots to look more “friendly” to humans by installing a small display screen and lighting on its small body. The screen and lighting, which is also where the robot’s main computer resides, helps distract people from the larger mini-tower affixed to the robot, on which is affixed sensors that scan items on the shelf. Hitch said that when the company asked customers to describe the robot, “nobody realized it was two meters tall” because they focused on the smaller robot body (resembling the Star Wars cylindrical robot R2-D2) and not its tower, which comprises the bulk of the robot’s height of around 6.5 feet. Walmart hasn’t revealed if it’s saving money by using Bossa Nova’s robots, but considering it’s testing them out in more stores, the retail company appears to be pleased its spending money on the startup.